Today’s project is going to be a fun one. We’re going to build a basic HTML/CSS demo page, then add in a button that allows the user to toggle the page’s color scheme between to states: day and night. As the colors switch, so will various other elements on the page. The really awesome part is that we can pull all of this off using only CSS. Along the way we’ll learn how to create a CSS-powered click event as well as how to wield pseudo elements to manipulate page content. Basically, we’re going to have a very simple stage that can be toggled between two states. The default state with be a “day” theme, which uses a light background and dark text. The second state with be a “night” theme with a dark background and light text. With the click of a button, you’ll be able to switch between the two. Not content with simple color changes, I wanted to take this idea even further, so we’ll change a few other things around as well. 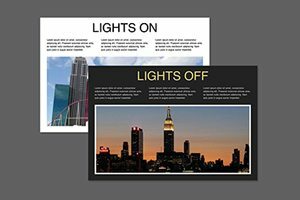 The dark and the light theme will also showcase different headlines and background images. The first thing we’re going to do is build our test page. There doesn’t need to be much here, just a few basic elements that we can play around with in our CSS. As you can see, I used a headline, three paragraphs and an image. The really weird thing here is the empty “headerimage” div. Normally, I’d just toss in an image here, but if we want to be able to swap this pic out in our CSS, we’ll have to insert the photo as a background image. Before we dig in and start styling specific pieces of our markup, we’ve got a lot of setup to do. First, we’re going to use border-box sizing to make our size relationships a little easier to manage. This manipulates the CSS box model so that the specific width of an object actually includes padding and borders. Next, I added a transition to everything on the page. This is certainly not recommended for serious web pages, but for our fun little demo, it’s the perfect way to make sure the lights on/off transition is animated. To finish off, I simply defined the sizes and padding for the page containers. Note that if we want to use height: 100% on the main class, then we have to make sure both the body and HTML are also set to occupy the full height of the page. Now it’s time to begin styling the specific elements on the page. We’ll start with our headline. Center it, give it a font family, and transform it to uppercase. Next, here’s where things get interesting, use a pseudo element to add in the word “On” after the text we inserted into our HTML. Next up are the three paragraphs under the headline. These should be floated left, set to a third of the parent’s width, and then cleared. There are also a few visual tweaks here, but everything is pretty straightforward. To finish off the demo page, assign a background image to the headerimage class and define the dimensions. As usual, I’m grabbing an image from LoremPixel. At this point, your page should look like the image below. Overall, it’s not very impressive… yet! In that post, we learned how to hijack a checkbox and bend it to our will. It’s not the most semantic of techniques, but it’s definitely a blast to toy around with. To get this party started, add in a label and checkbox input at the top of the body in your HTML. Essentially, what we’re going to do here is hide the checkbox itself and style the label to look like a button. The reason that this works is that, in HTML, the label for a given checkbox can be clicked just like the box itself to toggle the off/on state. To pull this off, set the label display to “block”, then set a height, width, background color, text-align, font and margin like below. Also notice that I set the position to “fixed,” which allows the light switch to stay visible as you scroll down the page. On hover, we simply change the colors around. To finish off, we use absolute positioning on the checkbox itself and push it out to no man’s land, effectively hiding it from the page. Here we used the adjacent sibling combinator, which is set to grab any “main” class that is immediately follows our checked light switch. This will effectively make the background color dark when the switch is off. The quirky part here is that you have to tie the second selector to the checkbox somehow because it really all makes up one complicated (and likely pretty inefficient) selector. For instance, we couldn’t merely grab the body, instead we had to use a sibling selector that defined the relationship between the checkbox and another element. You can also pull this off with the child combinator, which we’ll see in the next step. Step 9. Change Lots of Stuff! Now that we know how to use the light switch to change items on the page, we can go nuts. Here I change the text color, background color and even the background image to a night time photo! I also changed the h2:after text to read “Off” so that the headline will alternate between “Lights On” and “Lights Off” as you play with the toggle. Pretty cool! This gives us a nice dark theme that the user can choose to activate. All of our hard work has paid off, not it’s time to view the fruits of our labor. Be sure to click the light switch on the left to see the effect. Also, fork the demo on CodePen and show us how you would make it even better! We pulled off a lot of fancy CSS tricks today with very little effort. We created a click event by hijacking a checkbox, utilized changing pseudo elements and toggled the overall look of a page. As always, thanks for reading. I hope you learned a few things along the way, I always do!